Learn more about the courses offered in the Agricultural Science Department at Boone High School. High school students will be at the cutting edge of precision ag technology through a project to create a precision ag student training station. Thanks to Heartland Ag, Ag Leader, BEEF, and Monsanto Fund for their support. The Boone High School Ag Department was awarded a $3,500 donation from Farm Credit Services of America to improve the agriscience lab equipment in classroom. 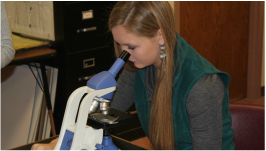 Over $50,000 in grants to enhance STEM in agricultural science courses has made a huge impact on the curriculum and learning for ag students at Boone. As a result, ag courses utilize the CASE model for their framework.